Desperate for money, Jenkins agrees to the mission and heads to the Russian capitol. But when he finds the mastermind agent behind the assassinations—the so-called eighth sister—she is not who or what he was led to believe. Then again, neither is anyone else in this deadly game of cat and mouse. Pursued by a dogged Russian intelligence officer, Jenkins executes a daring escape across the Baltic Sea, only to find himself abandoned by the agency he serves. With his family and freedom at risk, Jenkins is in the fight of his life—against his own country. New York Times bestselling author Robert Dugoni never disappoints. The author of the critically acclaimed Tracy Crosswhite and David Sloane series, Dugoni masterfully fills his novels with plenty of intrigue while keeping the reader engaged from the opening paragraphs until the tumultuous final sentences. The Eighth Sister is Dugoni’s first installment of the Charles Jenkins series, and it lives up to the expectations. An edge-of-your-seat international espionage thriller, The Eighth Sister is filled with adventure and intrigue. Every page turning moment of this American versus Russian covert game of chess brings back memories of the Cold War. It is a relevant story for the 21st century when Russia is again playing a leading role in international politics and espionage. Beginning and ending in Seattle, the novel takes the reader to exotic locations around the world and is filled with numerous gut-wrenching twists and turns. Filled with memorable characters, The Eighth Sister effortlessly draws in the most hesitant reader with clever and easy to follow dialogue. The development of the central hero, Charles Jenkins is effective, and we learn early on that he has bought himself some real problems when financial troubles and a family to support lead him to accept an undercover assignment. Although this sounds simple enough, nothing goes as planned, and Jenkins soon finds himself fighting for his life and his freedom. Dugoni subtly hints at Jenkins’ history within the CIA without offering up too many details. As the plotlines progresses, Jenkins finds himself on the run, and it is here that the reader learns more of his backstory. Overall, the plot is well developed and conceived. Dugoni keeps the chapters flowing and the action mounting as the struggle for Jenkins freedom becomes more and more desperate. When the storyline veers into somewhat predictable territory, the narrative takes a radical turn and becomes a legal drama. 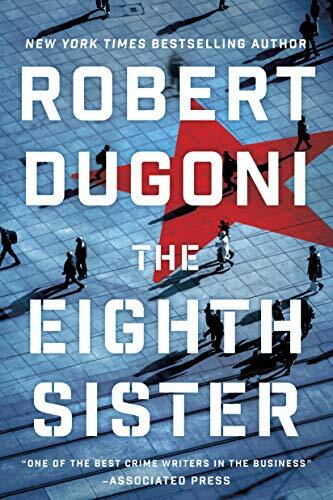 With The Eighth Sister, Dugoni has smoothly transitioned from legal thriller writer into an espionage adventure novelist. He delivers an exceptionally gripping spy tale that will keep readers on the edge of their seats. Arguably one of the best writers in the field today, Dugoni has created a new series that is sure to become a classic in the genre.